The office rental markets were shown in their best light with the positive economic environment prevailing in 2017: “new record levels of take-up and low completion figures pushed vacancy rates on many markets below the 5%, or even 3%, mark. The lack of available space is contributing to a slowdown in the rate of new lettings. Given those conditions, it comes as no surprise that the rental growth recorded in the past few years has continued. The sound fundamental data have further stoked investor demand in the office sector. However, the shortage of investment opportunities restricts the transaction volume, meaning that the figure of around €25 billion achieved in 2017 matched ‘only’ the level attained in the two previous years. Initial yields have seen a further significant decline. The good shape of the rental and investment markets is also reflected on the regional office markets, which accounted for approximately 20% of the investment volume in 2017. The momentum in the regional centres is quite clear from the analysis of asking rents, which CORPUS SIREO – in conjunction with the research institute empirica – tracks in the “Regional Office Index”: asking rents rose steadily in 2017. 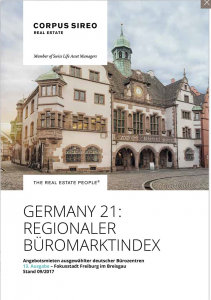 In this 14th edition of the index, CORPUS SIREO focuses on the Potsdam office market, which following substantial increases in recent years has attained one of the highest rent levels of the regional centres. 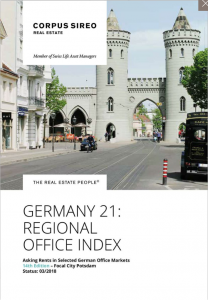 Shortage of Products driving office rents at A- and B-Locations: The CORPUS SIREO “Regional Office Index” study confirms the continuing positive growth of German A- and B-locations on the office markets. In the 19 B-locations studied, asking rents were €8.73 per square metre at the end of the first half of 2017. This signifies an increase of 1.9% compared with the end of 2016. In the top seven cities, asking office rents increased by 2.1% to €13.97 per square metre in the same time period.